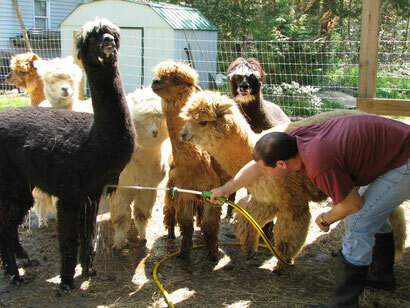 Frequently Asked Questions - Jersey Shore Alpacas - Fleece and Fun for Everyone! About your visit to our farm . . .
Our farm is located behind our home, so you'll be pulling up in our driveway. There are two "Alpaca Lovers Parking" signs at the end of the driveway, but if those spots are taken, feel free to park anywhere on the driveway, just making sure not to block any other vehicles, or on the center lawn (weather permitting). 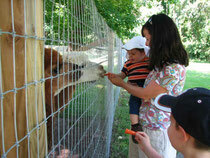 The alpacas will run to the fence to welcome you, and we'll come out with sliced carrots for you to feed them. (there is no charge for the carrots or the visit on one of our "open" days, but we do have a donation box available on the fence, should you wish to drop something in). You will enjoy feeding the 'pacas, and we'll invite you to visit our farm store, where you can see the many beautiful products made from alpaca fleece. We'll be happy to answer any questions you may have. Expect your visit to probably be from 30-45 minutes long. May I bring my own carrots for the alpacas? We appreciate your thoughtfulness, but we'll probably accept them, and use them for later, because we want to make sure to cut them up in small slices, for safe eating. Will I get spit on when I visit? May I bring my dog to the farm? I have a large group (such as Girl Scouts or 4H). May I bring them to visit the farm? Yes, but please arrange for a special visit in advance. That way, we can accommodate your group, and also plan a special lesson for them. We do request a small donation (per child) for large group visits, but we can discuss that when you call to set up your visit. About Alpacas . . . Yes, and both are in the camel family. Llamas are larger than alpacas, and they have banana-shaped ears. How long do alpacas live? About 20 years. Mainly good, quality hay and grass, but our moms and crias (youngsters) also get a pellet supplement twice a day. Alpacas have beautiful, extremely soft and warm fleece (fur) that can be made into luxurious hats, gloves, scarves, sweaters, and other clothing. You can feel the fleece and see examples of many different alpaca products in our shop. How long do the moms carry their young? Gestation is 11-11.5 months, and the crias are usually 12-20 lbs. at birth. Most birthing happens without human help. What kind of sounds do they make? Mostly they make humming noises, when they are not entirely happy or anxious. They can also grunt like a pig, cluck (mom's call to her baby) and make a warning call that sounds a little like an elephant! You can hear it on the last video on the Fun Stuff page! How often do you shear them? What do they do in winter? Alpacas actually prefer the cold to the hot summer. Their winter coats make them comfortable even in very cold weather. In fact, often they will even sleep outside in winter! Alpacas can sell for around $500 for a pet-quality male all the way up to over $20,000 for a champion stud. An average breeding female sells for $3,000-$5,000. Most alpacas have pedigree papers, are registered with a national registry and are also microchipped.